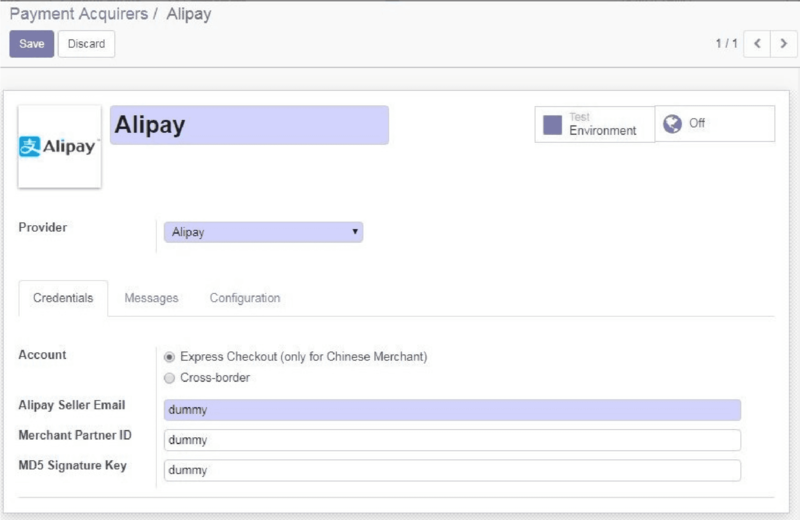 New payment acquirers- Eg Alipay. New flexible date filters allow you to group any date field of any document by day, week, month, quarter, and year. Support for recurring activities, email templates, and a new view to check all activities at a glance. Easily filter dates (today, last week, this quarter...) including flexible grouping of data by date (by day, week, months...). A user is either a portal user, a public user or an employee with system access. Create specific environments, for a group of workers or for companies. Create any action for any condition. 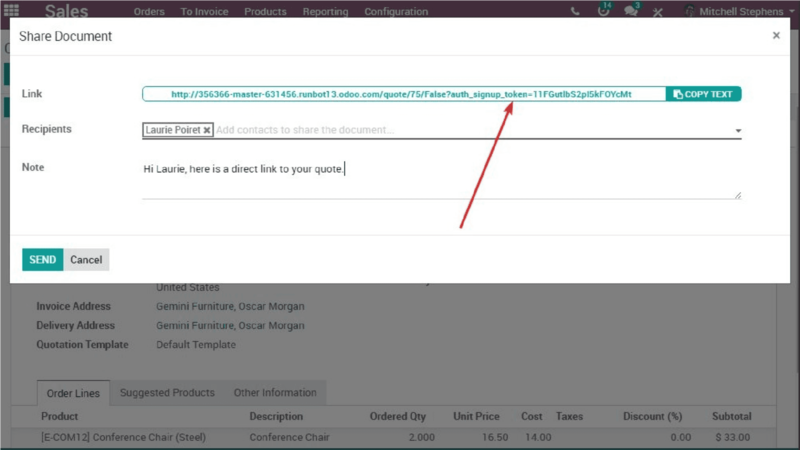 For instance, create an invoice or a task in Odoo. New interface with filters on folders or tags, documents in kanban and action manager on the right. Share any documents in public, select validity dates and give rights or not to upload and/or download. Create documents by email by sending to an alias. New dashboard view giving an overview of your inventory management. Gives average cycle times and delays and information about value coming in and out of the stock. Push and pull rules are merged into a single concept, easier to configure. If the PO has been triggered by a reordering rule, show that reordering rule as source document on the PO (even in case of multi-steps receipt). Add more information on journal items created through a change of the cost of the product. Clearer description of journal items. Improvement on the batch picking pdf to regroup the products to pick per locations. Improvements to the delivery slip, traceability, the picking operations, and the production order PDF reports to fit business. Representation of the routes that apply to the product, to ease the configuration and debugging of push and pull rules. When you create an RfQ for a vendor for which no prices matches, the default price is set to 0. If the PO has been triggered by a reordering rule, show that reordering rule as source document on the PO. BOs are taken into account when an RfQ is created. Other usability improvements on blanket orders include stages, vendor field required, adapted for multicurrency, and more. Generate purchase orders automatically for product of type service (MTO). Edit received quantity of a service on a PO. Starting tips have been improved to facilitate user onboarding: customize the pipeline, create an opportunity, schedule activities, and more. Dashboard views have been added in order to analyze lead generation and conversion at a glance. Followers of sales teams are notified at the creation of a new lead. The first user follows the default sales team. Sales Channels have been renamed into “Sales Teams”. Configure your sales app in a few clicks to start sending real quotations in no time. 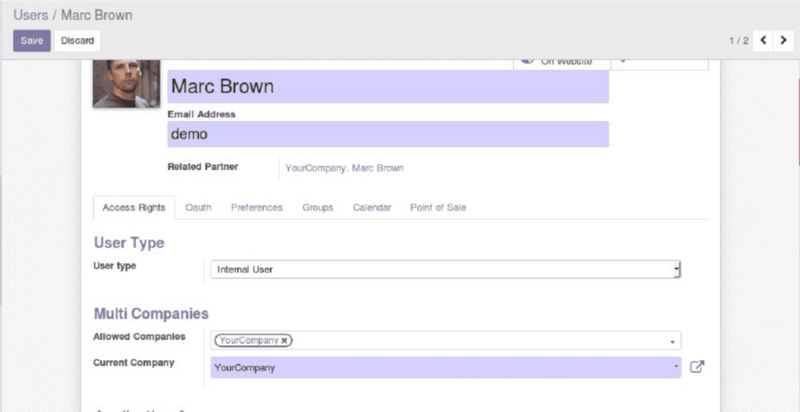 Add sections and notes on the fly to give a professional and neat structure to your quotations and invoices. Robustness - Prevent user to delete bases data like UoM categories or activity type. Prevent users to break their email templates. Creation of a super admin to prevent users to break admin access rights. Action Manager - Refactoring of the action manager. Removed View Manager which is now included in action manager. Staging performance - Optimize notification process and followers computation. Remove action on Fetchmail - Incoming email servers are not linked to a unique model anymore. With aliases and automatic thread creation, emails can create records in various models. Performance Optimization - Translation loaded 10x faster and 15% saving time on module installation by avoiding view validation. Regarding the other modules, you will not really be disoriented compared to the previous version. Subscriptions - The assigned salesperson will now be alerted when something needs to be done on the subscription. Accounting - Payment is only validated in Odoo once you have proof of payment, it stays as a draft before that. You can also now set up a direct debit on batch payments. Invoicing - Automatically generated communication field based on invoice number added to the payment request for wire payments. Expenses - Get the expenses and vendor bills related to your project on your project overview. You can also view how much was re-invoiced to the customer. Timesheets and Forecast - You can now create a SO and Invoice from the project app itself (project overview).